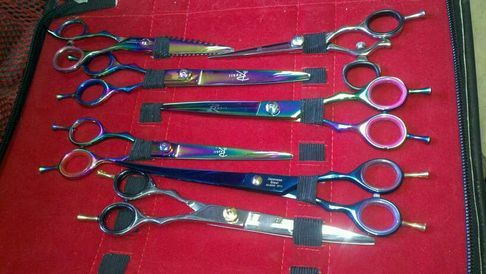 " THERE'S NEVER A DULL MOMENT "
WE ALSO SHARPEN A WIDE VARIETY OF SHEARS AS WELL , WHETHER IT BE CONVEX OR BEVELLED EDGE SHEARS. ALSO CONTACT US FOR YOUR CLIPPER SERVICE NEEDS. WE SERVICE OSTER AND ANDIS CLIPPERS. FOR PICK UP SERVICE IN OUR AREA PLEASE CALL OR TEXT 256 - 338 -3485. AND PLACE IN A USPS FLAT RATE SHIPPING BOX. THERE IS A $ 8.00 RETURN SHIP FEE. WE ACCEPT MOST MAJOR CARDS AT A RATE OF 3.5% SERVICE FEE.